Hey! Thanks to John (at Grasping for the Wind) pointing this out, I just received a free book from Tor in my email today! Spin by Robert Anton Wilson. I've read a few of this author's earlier works and enjoyed them, so I'm doubly stoked! Of course, as I noted yesterday, I have a shipload of books heading my way, so suddenly I'll be sitting on an embarrassment of riches, reading-wise. But how can you say no to a free eBook? (downloadable in 3 different formats, including HTML). 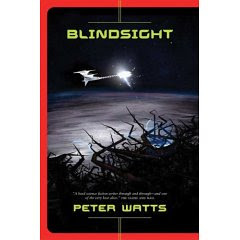 Ever since I read the spectacularly good Blindsight, I've been trying to get a copy Watts' earlier works, checking off and on at used book stores. The prices were always astronomical. However, thanks to a gift certificate (and more reasonable prices), I've finally got the first three of Watts' books on the way, beginning with Maelstrom. I can't wait to read these. You may recall my desire to find a substitute for kielbasa a few posts back. Though I have moved forward and bought ingredients to try some of the great suggestions I received in comments and in person, I also happened to see in my local grocer's isle a meatless kielbasa substitute: Tofurky Kielbasa. Well, I picked it up and brought it home. Tonight I sauteed a couple links in olive oil with some green bell pepper. I cut the links into bite size pieces, and just prior to dumping them into the lentil-black bean-rice dish I had simmering, I tasted it. I can't believe this oh-so-sadly-familiar taste is still being pushed on an unsuspecting public. Yuck. This is nasty. Stay clear, friends. I recently subscribed to a blog called SF Novelists. One of the contributors wrote a blog entry that really made me think. In summary, Ms. Reese would prefer if the way a character fights reveals a deeper insight into that character. Check out the actual blog post here, Pushing Your Punches. Hey, what an interesting concept! I decided to learn more about this author, and discovered that after joining up just five or so years ago, she has become a very serious practitioner of martial arts. 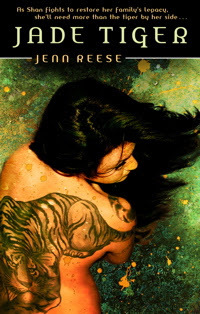 And, using her new knowledge, she wrote a fiction book called Jade Tiger . Well, this summary describes me, too (started martial arts about five years ago, and in that time have become more and more into it, and I have a fictional character who puts to use the martial arts I learn in reality). So I couldn't resist buying Jade Tiger to see what the author did with her character. Here's my short and simple review: This book is a fast-paced, modern day pulp. If you want to be wowed by displays of martial art that supersede our own dull world, Shan Westfall is your heroine. While I identified with the male lead, an archaeologist, and probably would have been just as much "in worship" of Shan as he instantly was, the unfolding relationship these two enjoyed seemed a little too destined, and a little too rushed. Of course, the whole book was that way--a rush (in the best sense of the word). So I suppose it was of a piece with the narrative. I actually quite appreciated that the story didn't explore finding each and every piece (5 total) of the missing artifacts Shane sought--after one such sideline to discover a piece called the Dragon, the characters relatively quickly find themselves in the conclave of the mad martial-artist-villain. Here we get to enjoy several sweet fights in fast succession, a consummation of the building romance, and a demonstration of the fully armed and operational Jade Circle, in the villain's hands. Overall I quite enjoyed this story and give it thumbs up. I'm home this week outlining a new book. As I was going through old notes, I found a character profile for Kiril Duskmourn, one of the main characters in my novel Stardeep. This was slated to show up on Wizards' publishing page in December to promote the book, but I don't remember seeing it. Late's better than never, right? Kiril Duskmourn is on the run. She flees the honors she once attained, and the memory of noble deeds she accomplished. She seeks to outrace the price she paid for her triumph: the loss of her love, and then, the loss of her innocence. Kiril has blood on her hands, and redemption lies beyond her grasp. So she wanders, a hard-bitten, drunken sellsword perpetually a few drinks from oblivion, courtesy of the bottomless whisky flask strapped to her belt. She curses and swears her way from one day to the next, unable to put behind her the tragedy that changed her life. How could she forget? After all, strapped to her other hip is the sword Angul. Angul's unforgiving steel contains the soul of her dead lover, a soul stripped of all darkness, doubt, and mortal failing. In Angul burns a righteousness that surpasses worldly virtue. His light burns away all doubt and shades of gray, bathing his wielder in warm, certain, and lethal clarity. When one wields Angul, no wrong is too small to punish. It was Angul that drove Kiril to the crime she flees to this day. She hates the blade and what it made her. Yet, she yearns for it, too, for it is her last and only tie with her lost love. To give up Angul would be to give up the only thing she still cares for. Now, a message summons her back to the hidden dungeon of Stardeep, a message that finds her a full decade after she fled her duties there. Kiril has no choice but to respond. How can she do anything else? The message is, impossibly, from the long dead man who's soul is trapped in her sword Angul. I'm working like mad to finish a project at Wizards, a game book due out in early 2009. This is a big project, which means two freelancers in addition to me contributed content. Besides writing, it also falls to me to stitch together the material of all the contributors into a cohesive whole. * That means answering questions of the freelancers along the way, providing feedback on milestone turnovers they provide, and then putting all the various pieces of the book together chapter by chapter, not just text, but also the art and maps. This week I've been entirely consumed with putting together the art and map order, which is quite a process. Each order will go to an artist or cartographer who will create the art scene requested--in a 288 page book, you're looking at around 135 pieces of art. I see the light at the end of the tunnel, and intend to turn over the complete project, fitted and vetted, with art order and all other expected components by tomorrow evening. Then, I take a week off! 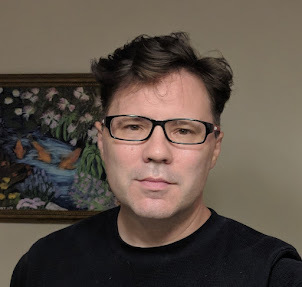 Of course, I'm taking a week off to write an outline for another project (this one a novel whose outline requirements are rather different than a game book). Where's my vacation? But I look on the bright side; at least I've managed my schedule well enough that everything fits! 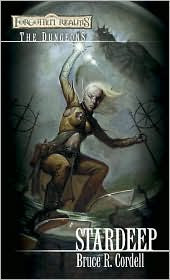 *This role of writer and project lead is one I recently assumed for the Forgotten Realms Campaign Guide and another book which freelancers are even now beginning due out later in 2009. As I noted in my last post, I'm going to make another attempt to go meat-free. As it turns out, I already eat no meat for breakfast and lunch; I eat an orange, half a banana, and a handful of blueberries for breakfast, and Jan 1 began eating a container of radishes, broccoli, carrots and apple slices (with at LEAST 2 tablespoons of peanut butter on the side) for lunch. For a snack before and after lunch, I usually eat a fruitbar, half at a time (Larabar). But dinnertime is where I'm going to run into a problem. For instance, my favorite vegetable stew and rice-bean dish includes kielbasa as a crucial accent ingredient. I'm not sure what I can substitute for kielbasa. Some sort of roasted eggplant? If you have a a favorite vegetarian recipe, I'm also eager to hear it. My old friend Sean (who's been a vegetarian as long as I've known him) just posted a few weird food choices (his words) that he likes. I'm not sure about the saltine one, but I'll try the omelette :-). I heard a story on NPR (probably the Radiolab program) about a guy doing research on rats. Apparently, rats vocalize at too high a pitch for humans to hear, but special microphone equipment in a rat cage dials down the pitch enough to allow us to hear the occasional little chirps rats make at this frequency. After ten years of study that went nowhere, the idea came to the researcher to tickle a rat. Suddenly, the chirps came hard and fast and sounded oddly like . . . laughter. Anyway, the thought immediately occurred to me that if rats can feel this very simple human joy, it's probably true that most mammals can. Even the ones we regularly slaughter and eat. Which leads me inexorably to my next thought: I don't think I can morally justify personally eating higher order animals. So I'm back to being a vegetarian. I'm afraid birds are out too--but I'll still eat eggs, milk (and cheese), and fish. This'll be the third time in my life I've tried to be a vegetarian. Maybe third time'll be the charm? My omnivore genes may power through my moral decision in the end, but I'm ready to give this another go. The two biofuel studies we discussed a few entries ago also sparked an 40 minute discussion on NPR's Science Friday last week. As a couple of of you pointed it, it may be that algae is the way to go in creating biofuels from garbage and left-over bits agricultural waste. Apparently, the mix of biofuels currently supported by legislation specifically asks for corn ethanol, which is the problem. But the more we can get the word out that cradle-grave accounting of a fuels carbon footprint is the way to really assess a fuel's real value, the better. Here's the link to the SciFri archive on biofuels. It's a great listen. East Hill Pet Sitter (via Susan Metters) provides another lens for us to look at the candidates for president: what's their record regarding the voiceless creatures of the earth who have no one but us to be their advocates? [...]The links below detail where our presidential candidates stand on animal welfare. It’s based on their track record of how they've voted on animal issues in the past, and also anything that's been in the news about the candidate and animals. It was written about a month ago so it includes candidates that have since dropped out of the race. Even if you've already voted in the caucus it's good to have this information when the time comes to vote for the office of the President. We are the voice for the animals. If we don’t stand up for them there’s nothing else. Wouldn’t it be amazing if the President of the United States were a humane and compassionate fellow mortal? Don't worry, I'm not talking pets or humans. I'm talking, first, my 5 year old 17" Mac Powerbook. It died this weekend. This machine has seen hard use, day in and day out, running 9+ hours a day. It is the tool I used to write pretty much everything since 2003. I will miss you, Mac Powerbook. On the lighter side, I finished the 2nd draft of a Forgotten Realms novel last night (on my wife's computer). I started this one last March, turned in the 1st draft in December, got back comments, and here we are in February, done! I'm not sure I can divulge the name yet, as it hasn't yet appeared in a catalog or on Amazon. I have two weeks free before I have to get to work on the second in the trilogy. Perhaps a new laptop solution will find me before then. Biofuels seemed so promising at first -- what could be cleaner than running our cars and factories on plants? But early prognostications were a bit thin on details. They didn't always account for the energy that would be needed to grow, harvest and refine the fuels. Most importantly, they didn't consider that greenhouse gas-gobbling vegetation would need to be cleared for fuel crops -- or, if these were planted on existing pastures, that new fields would be cleared to make space for displaced food crops. Put these factors in the equation, and biofuels don't do much good at all. Let's wrench ourselves away from this course before more tax and private money is spent. Let's let our political leaders know that being green requires a little extra research into outcomes. If I had to guess the future for fueling the vehicle you buy 15 years from now, I'd guess a plug-in hybrid that get the vast majority of its energy from a grid run on these new, ultra-cool maglev turbines. Of course, thin-film solar panels on your own house will also be part of the equation. I could give several lame excuses why I didn't know (and probably still don't really know) how the Democratic caucus for choosing a presidential candidate in WA works. But, now I know; I just found out earlier this week. For instance, I had no idea that my vote-by-mail in the primary for Barack means zilch. Window-dressing, my friends. Really. If you live in WA and you think your Democratic vote for one of the candidates means something... well, read on. Apparently in WA if you're a Democrat, if you want to have any voice whatsoever in choosing your party's candidate, you must show up at the caucus physically. This Saturday. At the caucus, apparently, choosing delegate numbers comes down to how many people are standing in the Obama group vs. the Clinton group when the caucus concludes (after you get a chance to tell everyone there why they should really be in your group). The number is counted, from which is alloted a proportional number of delegates to each candidate. So, go to your caucus on Saturday, even if you voted in the (apparently meaningless) primary! Want more info about WA caucuses and where to go if you want to spend a couple hours helping choose a new direction for our country? Visit this link. What if digital avatars ten years from now where so realistic, your brain was actually tricked into thinking you were one and the same? Science fiction? Nope. body maps in the brain on the show Berkley Groks Science. My old friend Jeff Quick remembered how I used to evangelize the health risks of consuming hydrogenated oils [as reiterated here], and told me he now stayed well clear of it. Well, it's been over a decade since I began that crusade. In the last few years my voice and many others have had a positive effect--I'm not the crazy lone doomsayer any longer. Now, for instance, you'll regularly see packaging claiming the food inside contains "0 Trans Fat." Thus Jeff's [and Charles's] question: "I see a lot of labels nowadays crowing about 0 grams of transfat, but they still have hydrogenated oils in their ingredients list. What is your opinion on this turn of events?" I told him my guess was food manufacturers could legally get away with claiming 0 trans fat if the amount contained was under a certain threshold. Well, by pure happenstance, it looks as if I didn't lead him wrong. "[Under FDA rules, food manufacturers are] required to post just how much of the artery clogger (trans fatty acid) is in the food--unless there's less than .5 grams per serving, in which case they can say 'zero trans fat.' The problem is 'one serving' can be misleadingly small--seven or eight 'free' cookies could sneak in 3 or more grams of trans fat." There it is--if you see hydrogenated or partially hydrogenated oil in the ingredient list, stay clear. Next time you reach for the coffee creamer, the margarine, or even your favorite brand of potato chips, flip over the bag and take a look at the ingredients--if you see hydrogenated or partially hydrogenated oil of any type, you're eating a trans fatty acid. What is a Trans Fatty Acid? Imagine an oil as a string of carbon atoms that hang together like bulbs on a string of Christmas lights. Some oils are a bit more complicated, and have hydrogen atoms stuck on them. When the oil is completely filled with hydrogen atoms, the string of carbon is called a Saturated Fat. The way that the hydrogen sticks to the carbon is important. If the saturated fat is naturally occurring, the bond is called "cis." A regular saturated fat could be called a Cis Fatty Acid. You guessed it, a Trans Fatty Acid is a lot like a regular saturated fat, except for the way that the hydrogen atoms stick to the carbon atoms. Trans fatty acids are made when food companies shoot hydrogen gas through oil. Some of the hydrogen sticks to the carbon, but in a rigid way that makes the food last longer on the shelf . When hydrogen is artificially attached to carbon like this, the bond configuration (the type of connection between the carbon and hydrogen) is called "trans." Saturated fat of this kind is called Trans Fatty Acid. Your body can't tell the difference between a normal cis fatty acid and an artificial trans fatty acid. When you eat a trans fatty acid, your body incorporates it into your cells--your cells actually become hydrogenated! The consequences include increased occurrence of heart disease, sexual dysfunction, weakened immune system, cancer, atherosclerosis, diabetes, and obesity. Margarine, non-dairy coffee creamer, some whip creams, "soft-serve" ice creams, many breads, restaurant french fries, restaurant and supermarket fried chicken, restaurant and supermarket fried food of all types (sadly, old-style lard frying was healthier because frying took less time so less oil penetrated the food, and it was cis-fatty acid), most crackers, some "health" foods... the list goes on and on and on. Hydrogenated oil (trans fatty acid) is in more than 70% of processed foods found on store shelves! It's up to you to check out the INGREDIENTS ahead of time for hydrogenated or partially hydrogenated oil! Stop buying foods that contain partially hydrogenated oils. Lately, I’ve noticed that some foods come right out and say ‘No trans fats’ and ‘cold pressed oils’ in bold letters. You can find alternatives without this terrible additive. Here's the golden rule for eating right: Eat whole, unprocessed foods when possible. Try to buy foods that use cold pressed or expeller pressed oil in the ingredients (oils so labeled are unlikely to contain trace organic chemicals). Don't be afraid to consume foods high in natural fat, including animal fats (in moderation). No kidding. Good luck--be healthy! Look how badly such a policy turned out for contemporary states who've decided gods laws are good laws for human society: A student journalist in Afghanistan has been sentenced to death for downloading and distributing a report that is critical of the oppressive treatment of women in some Islamic societies.